The SLC is looking for a Student Content Creator. Contract starts May 1st and ends Sept 3rd. Guided by the Creative & Communications Coordinator, the Student Content Creator will be tasked with understanding the voice of the SLC and the guests who use the space. They will be producing creative writing pieces for print and digital, as well as social media content. Get ready to collaborate with stakeholders, team members, and students; creating great work is a team effort! Or, log into the Ryerson Career Boost site and search under “Other On-Campus Job Opportunities” for the Student Content Creator posting. This position is NOT a Career Boost position. We are so excited to showcase the diverse talent, creativity, and enthusiasm of the Ryerson community at Taste of The SLC 2019. 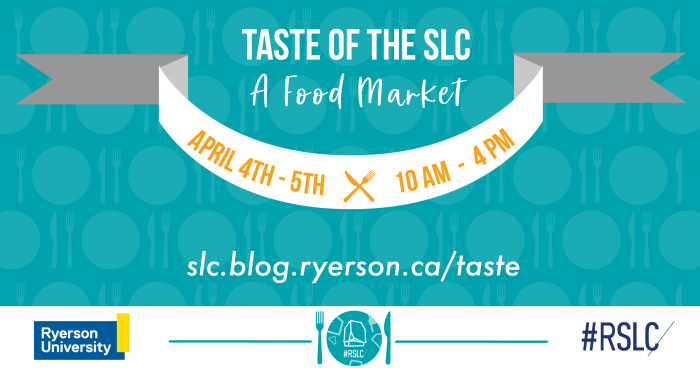 Bring your appetite to the SLC on April 4th and 5th from 10 AM – 4 PM as bakers, chefs and decorators offer a selection of tasty treats! MWL Pastries, by Nicole Villamor – Baked goods ranging from cakes, cupcakes, cookies, brownies, French Macarons, cakepops. Fait à Maison – by Lili Tran – We are selling home cooked meals. 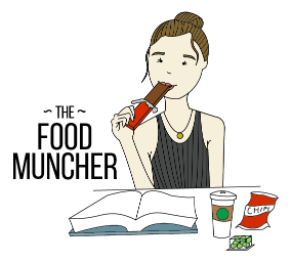 Our menu includes, mac and cheese, broccoli cheddar soup and chicken cutlet sandwiches. Goma’s Crew, by Lucy Liu – Bakery products. Cookies, cupcakes, brownies, and dumplings. Ryerson Fencing – Crepe Menu: Cheese n’ Chicken, Ricotta Spinach Mushroom, Nutella, Banana/Strawberry, Basic- Nutella and/or Jam , Whip Cream opt. Bakies, by Shelisa Ward – Baked Goods and catering services. The 7th floor of the SLC will be closed for renovations from December 17th to January 7th. We heard your feedback, and are taking action to make the SLC a better space for you! We are improving sound absorption by insulating our study rooms. The rooms won’t be soundproof, but better sound absorption will provide a quieter study environment. New whiteboards will be installed in each of the Collaborative & Group Work Rooms along with brand-new AV tech cabling. We’re working hard to enhance your experience in the SLC! Please help us keep the SLC world class by treating equipment with care and respecting the needs of the students around you. All other floors of the SLC will be available for students throughout this time. For a full list of our buildings operating hours, click here. The School of Performance, located at 345 Yonge Street will be hosting their annual Parodos Festival from June 14 to June 17. Check out the exciting and diverse work of dance, music, theatre, and spoken word of emerging and established artists side-by-side. The SLC celebrates the Class of 2018! The SLC welcomes you to watch Ryerson’s Spring 2018 Convocation ceremonies! Join us in congratulating our graduands by watching them live on the big screen in the SLC Amphitheatre between June 6th and June 13th. 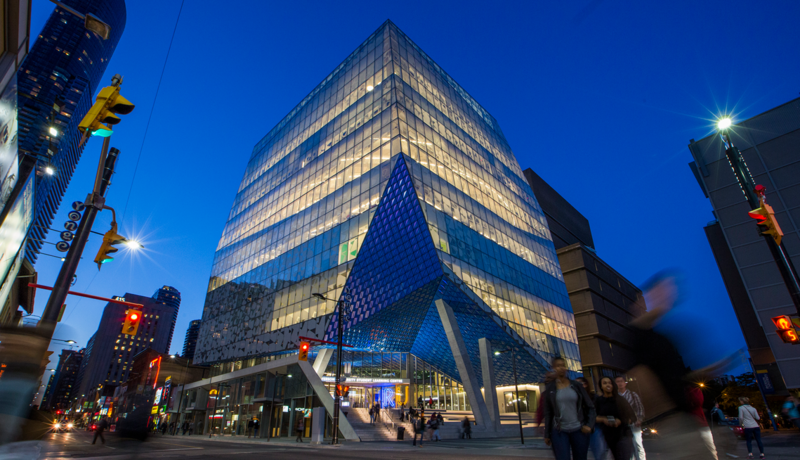 Ryerson University and the SLC will be joining millions around the globe to shine a light on climate change action by participating in Earth Hour. We will celebrate our collective commitment to our planet by switching off the lights from 8:30 p.m. – 9:30 p.m. on Saturday March 24, 2018. 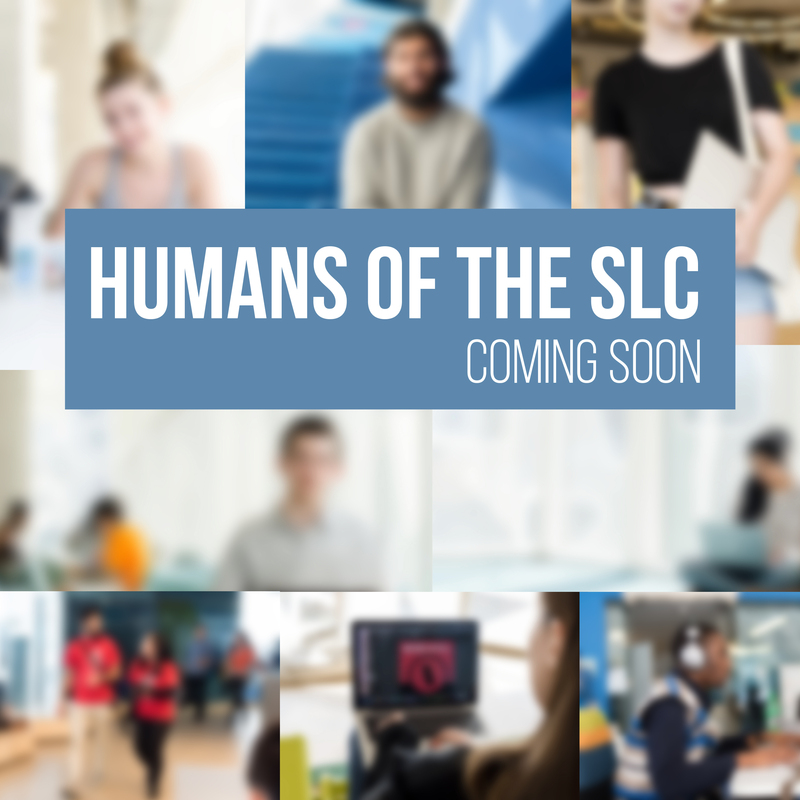 Humans of the SLC aims to showcase users’ experiences within the building and reflect on what exactly makes a place feel like home. This is a project created by students for students. As the final part to this pilot, we share with you the stories from the creators themselves, David Chau and Danielle Howson. This is their story. Humans of the SLC is a project created by students and for students. It aims to showcase users’ experiences within the building and reflect on what exactly makes a place feel like home. This is the start of your story.